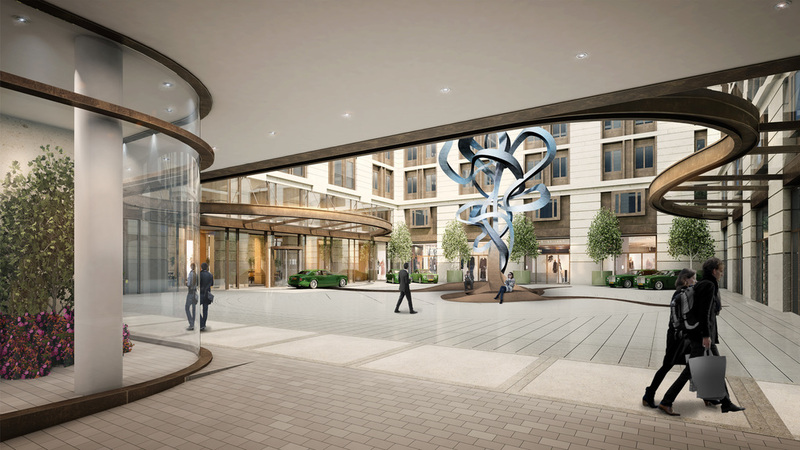 The work, which focuses on the tree’s natural qualities such as texture, colour, smell and shape, is suspended upside down from the glass ceiling off the Rotunda in the Millbank entrance, its roots exposed and covered in gold leaf, drawing light and attention to what is usually hidden. 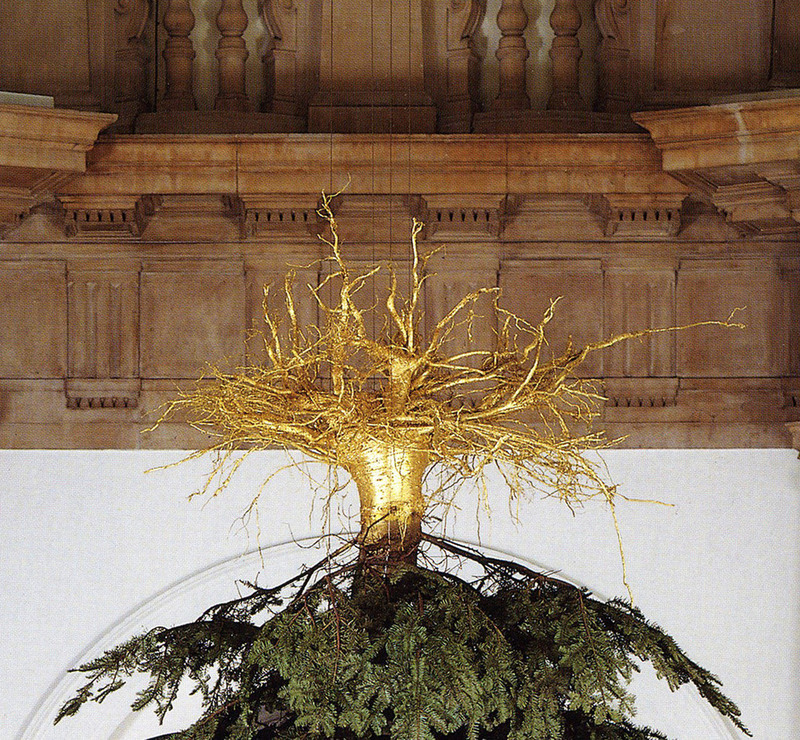 In 1993 Houshiary has described her tree for Tate Britain as ‘taking earth back to heaven’. Today she would like us to contemplate that the pine tree is one of the oldest species and recognise the roots are the source of its continued stability, nourishment and longevity. As the roots remain hidden, Houshiary suggests it is best to seek what is hidden rather than what is apparent. As a Buddhist monk wrote ‘An old pine tree preaches wisdom’. The imagination and body of man are subject to the same laws that govern nature. 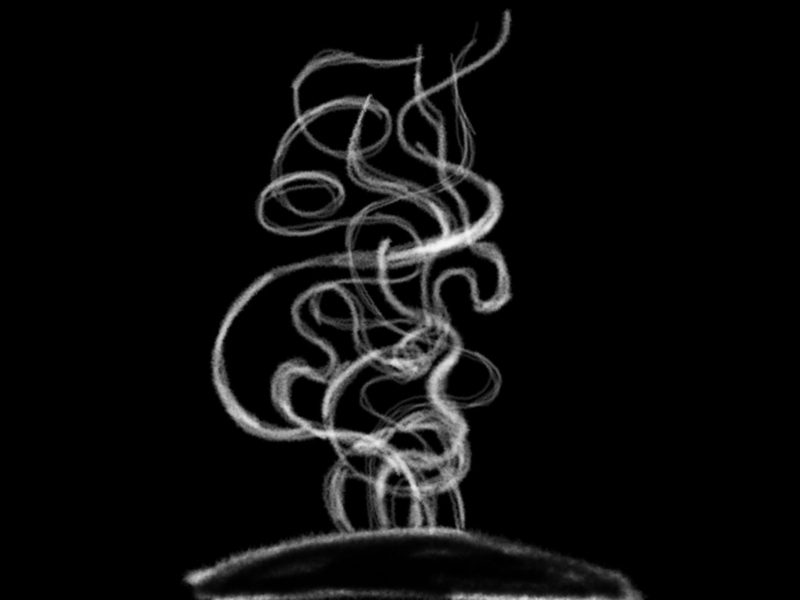 Light and smoke are the inspiration to generate the form of a sculpture that expands and contracts, emerges and disappears and spirals to suggest the presence of an ascending and descending vortex. 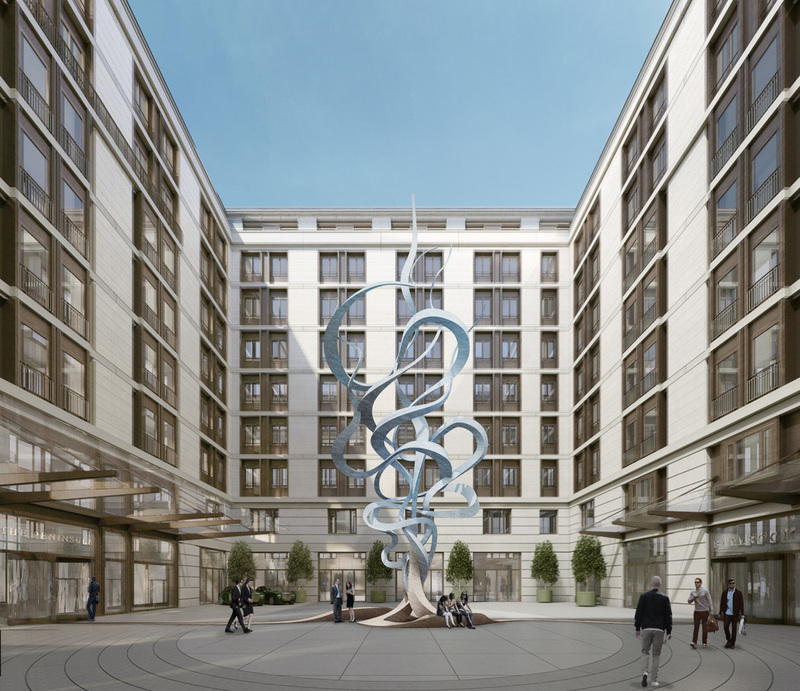 Three bronze roots extend from the courtyard perimeter to its centre twisting and spiralling upwards to become five ascending triangular ribbons of lightly polished stainless steel that dance and weave and then diminish and dissipate to a point about 30 metres from the ground. 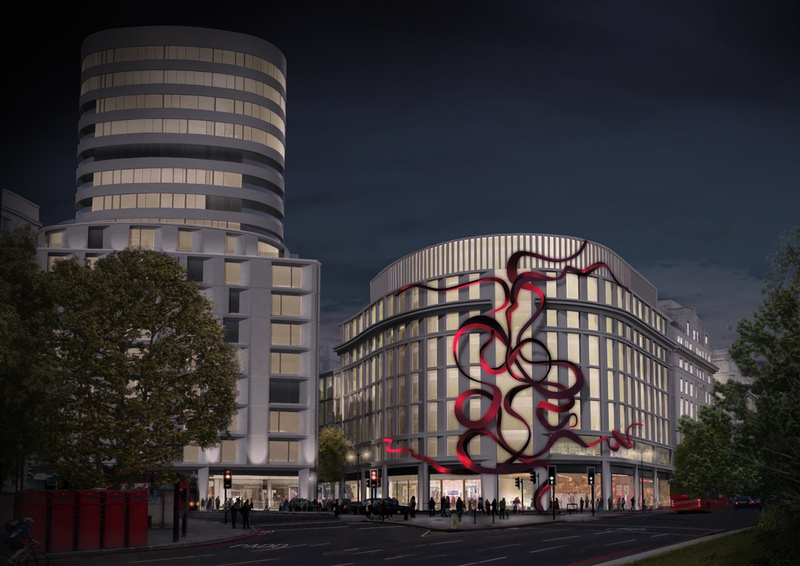 The roots with their earthly coloured surface are in cast bronze and as they rise at the centre they transform to the silvery light of stainless steel.The twisting sinuous surface of the ribbons reflect and harness the light to appear and dissolve in equal measure. 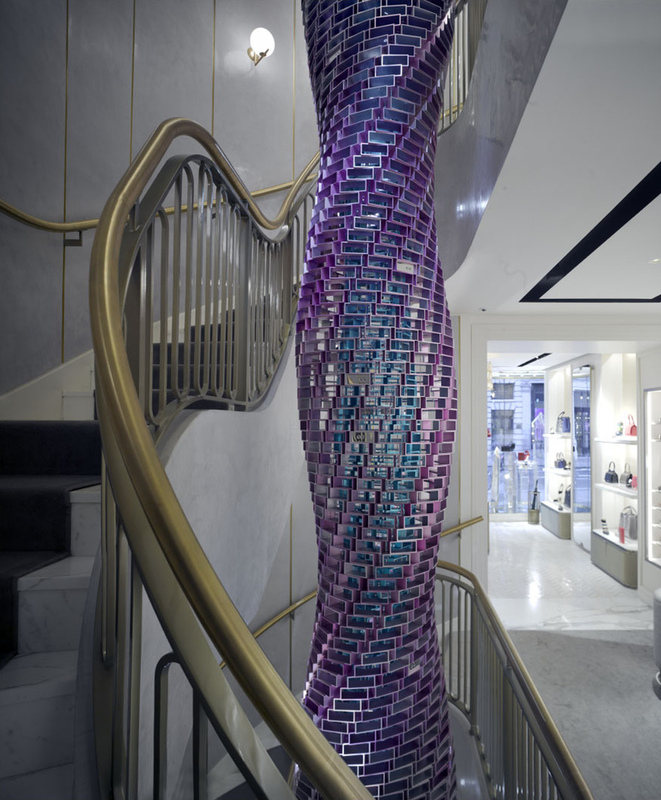 Chrysalis is a double twisted matrix of hollow anodized aluminum bricks in two colours with infinite shades suspended in the central staircase of the flagship New Bond Street townhouse of Jimmy Choo Store. In it’s most literal sense Chrysalis is a cocoon where the caterpillar transforms into a butterfly, a space and time of transition. 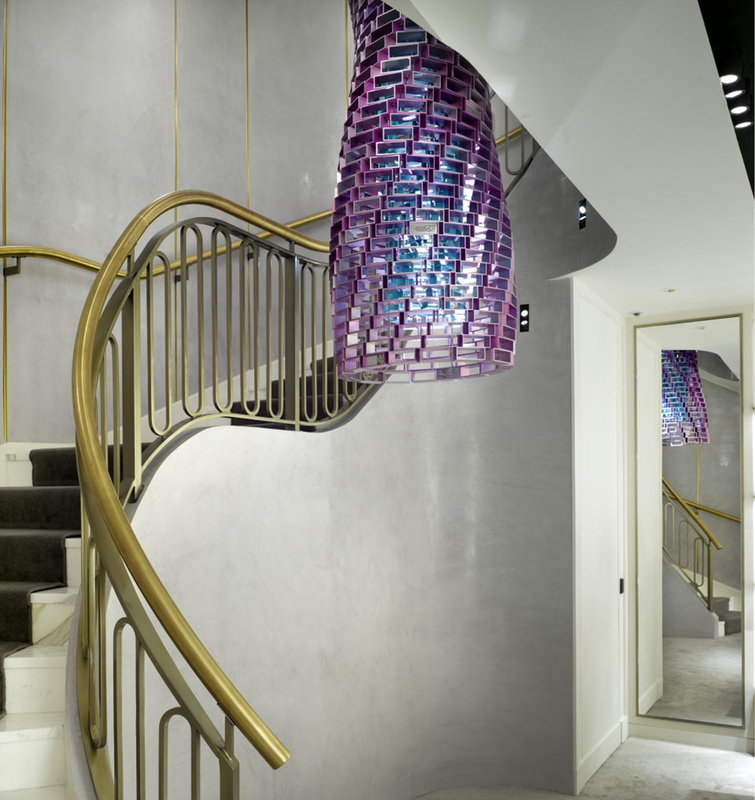 Inspired by the ideas of transformation and metamorphosis, Houshiary designed Chrysalis as a place where light, colour and space echo and liberate the viewer from gravity. 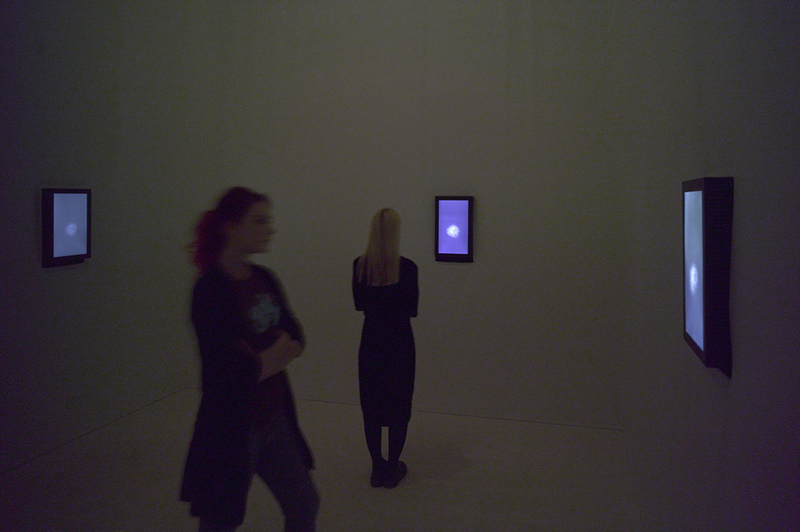 In Breath 2013 the evocative chants of Buddhist, Christian, Jewish and Islamic prayers emanate from four video screens. 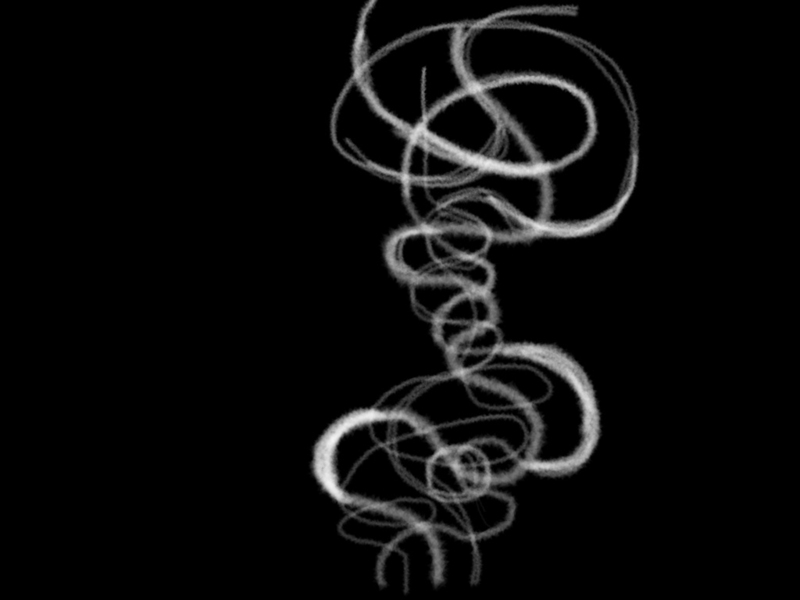 The sound is choreographed with images that capture the expanding and contracting breath of vocalists. 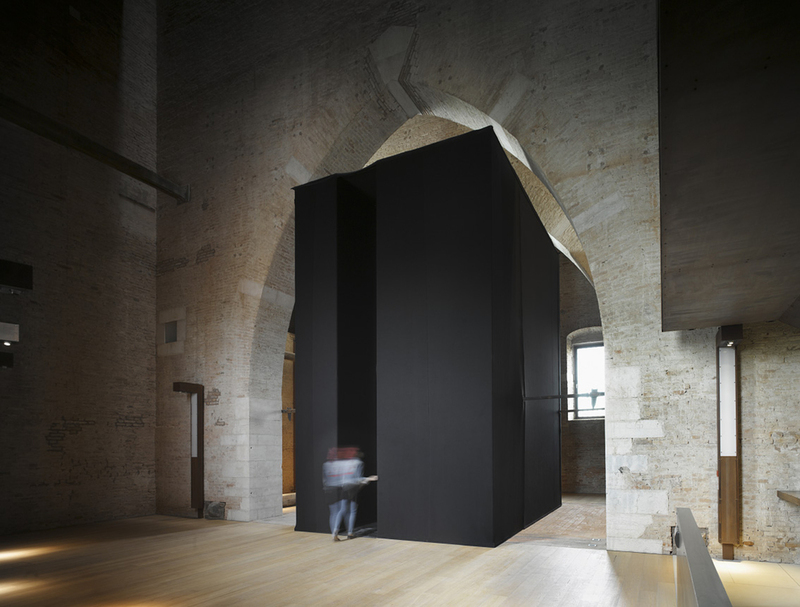 The installation takes the form of a rectangular enclosure clad in black felt, which is entered through a narrow passage that leads to a dimly lit white interior. There are four screens hung at eye level from which the chants of different traditions rise and fall, swell and dissipate in a haunting chorus that fills the room and permeates beyond each of its walls. Where inside there is unity, outside is multiplicity. The form of the proposed altar resembles a sarcophagus and is made from a single travertine block. 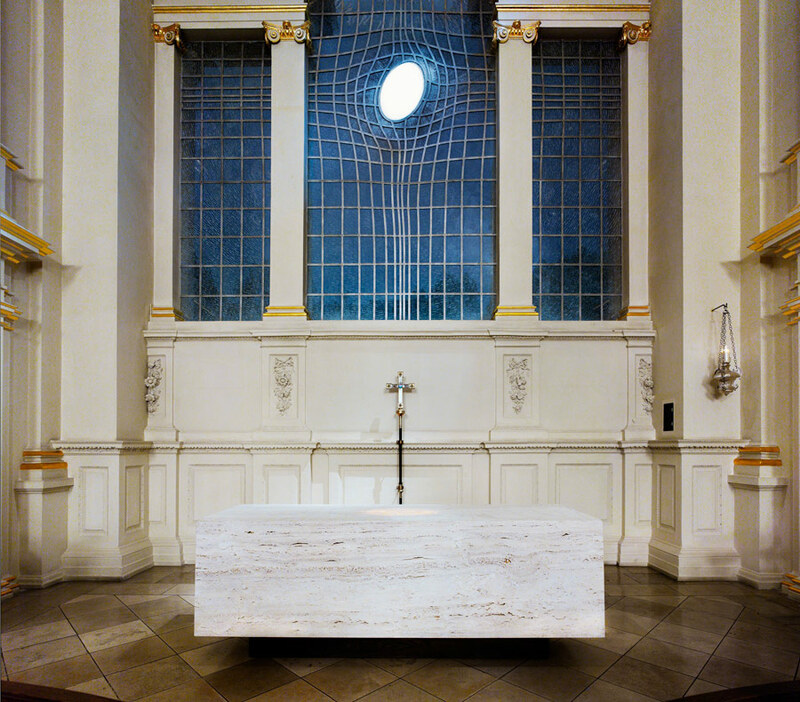 It ‘floats’ on a plinth of dark stained oak similar to the material of the church’s choir stalls and seating. The bone coloured ‘travertino osso’ surface is full of natural open pores and fissures that suggest wounds, skin and body. 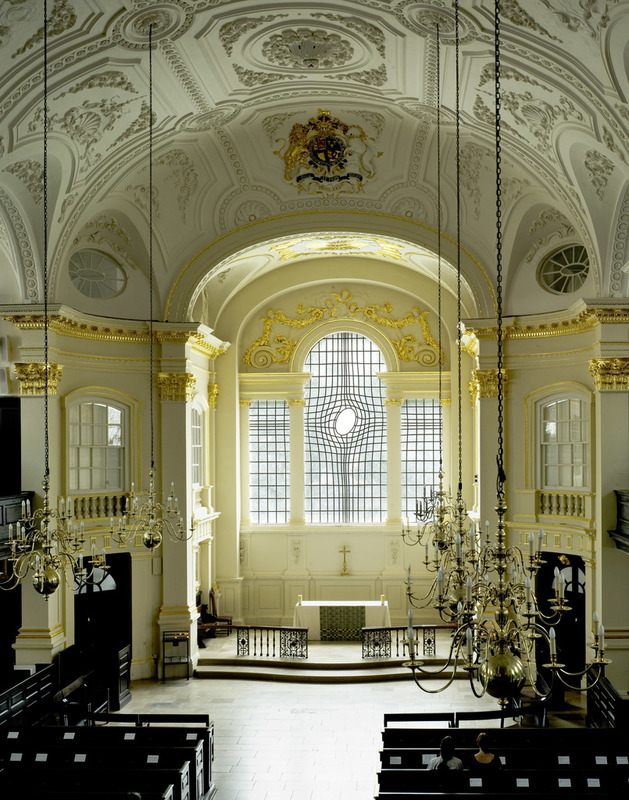 The centre of the altar top gently ‘glows’ to achieve a transfigured expression. 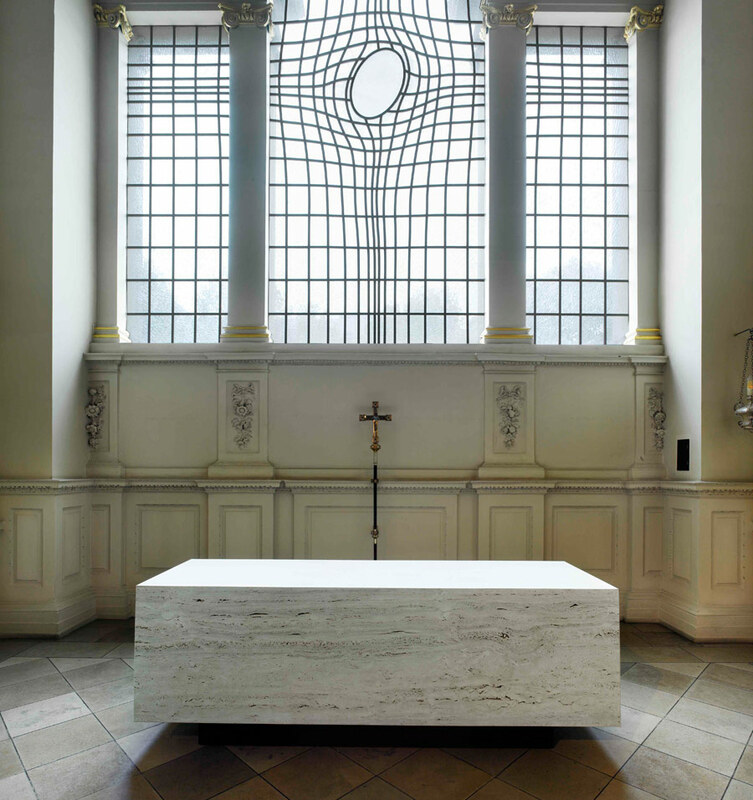 The altar is a very simple design where the presence is revealed subtly from within. This is complimentary to the new East Window where presence is expressed by radiating outwards. Both suggest presence being revealed in absence. 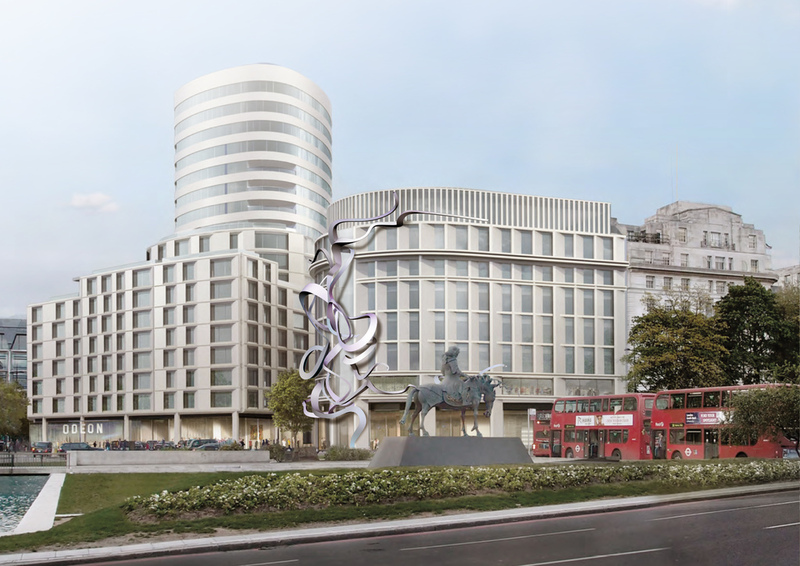 The proposal is a sculpture tower approximately 75 metres high. The site commands a central position in the Olympic Park London. 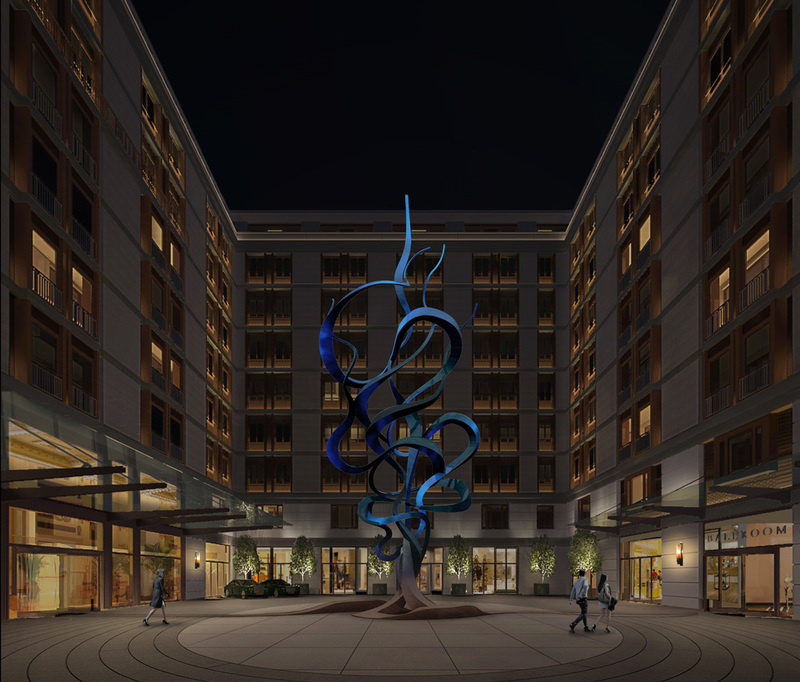 Inspired by the Olympic rings the sculpture consists of five ascending steel spiralling ribbons that unravel from the ground. 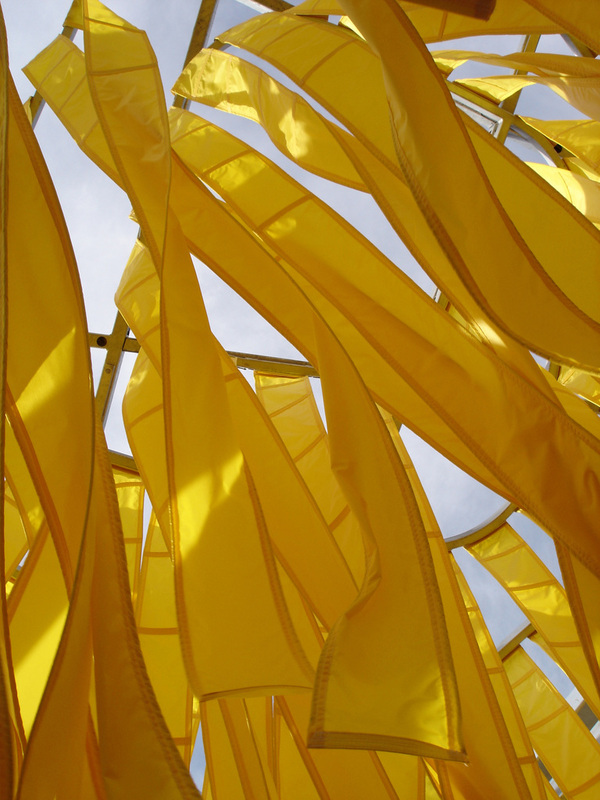 Each of these ribbons rise at a different wavelength and intertwine and weave gently upwards. 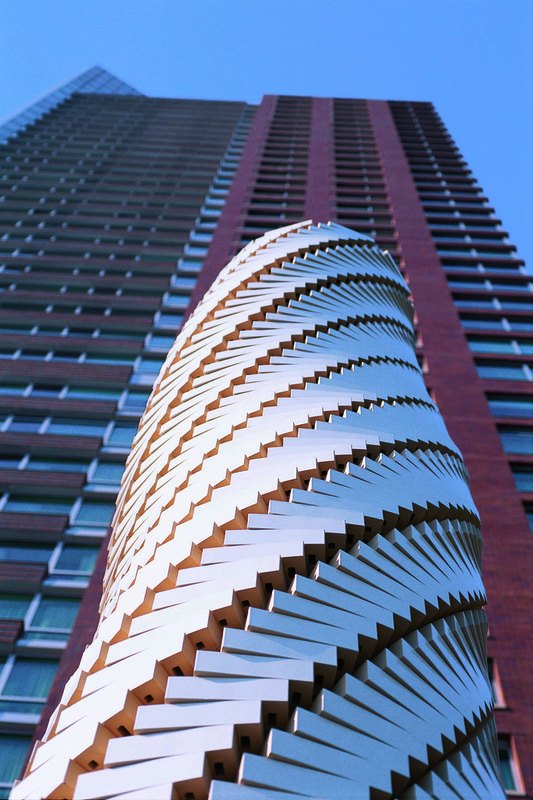 From a distance its curves and bends at first appear random but to view it up close or to look up from the centre of its base reveals its concentric movement. 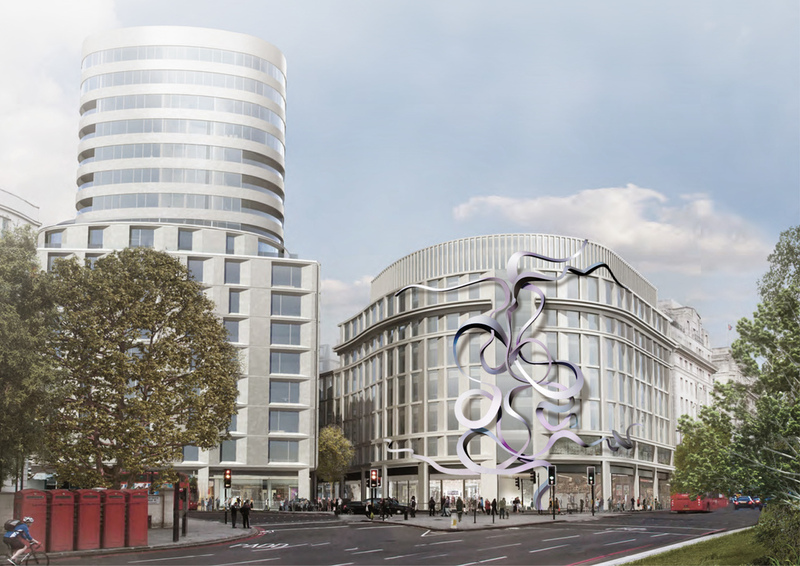 The ribbons are made from polished and textured stainless steel which in the changing daylight will animate and dissolve as if in a dance. 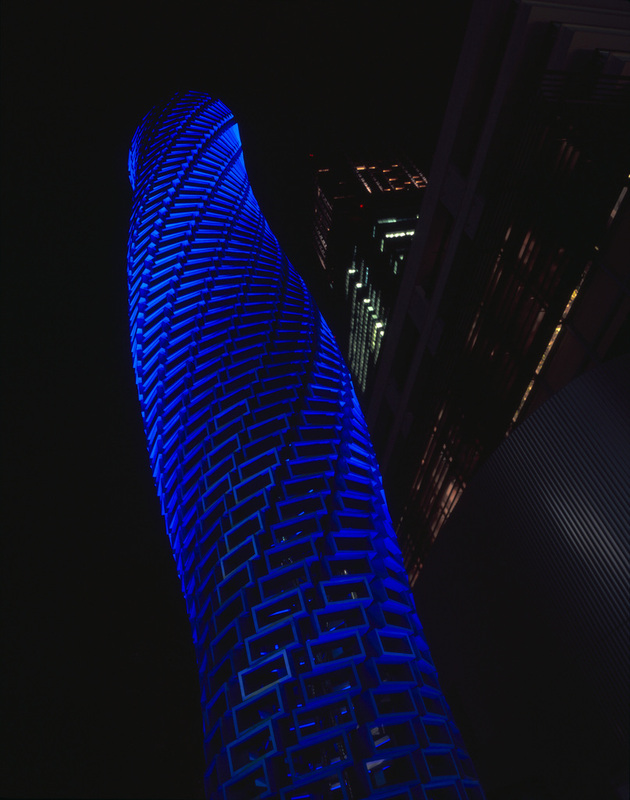 This is further enhanced at night by using fibre optic lighting which is integrated within the nodes of each ribbon and extend upwards the entire length. The lighting can then be programmed with different lighting themes in any colour and choreographed to suit any event pre Games, during or post Games over part or the entire structure. This can be achieved remotely or a haptic way by touching the surface of the ribbons at the base. 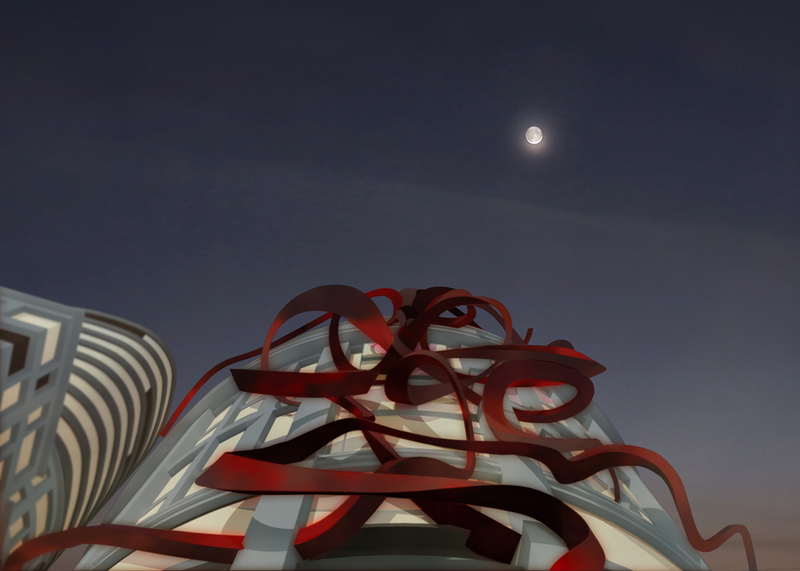 The structure will be an iconic image easily seen from all parts of the Olympic Park and beyond. 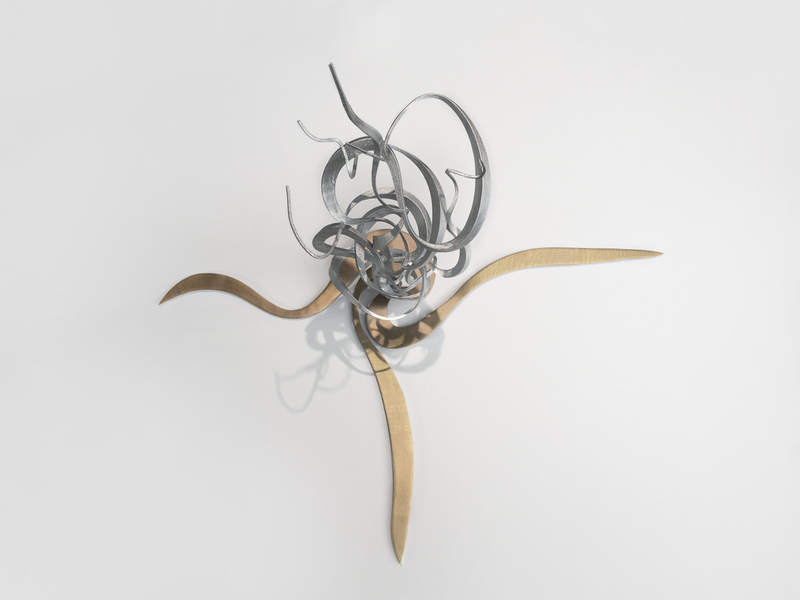 Its form and meaning may be interpreted as a crossover between culture and nature. 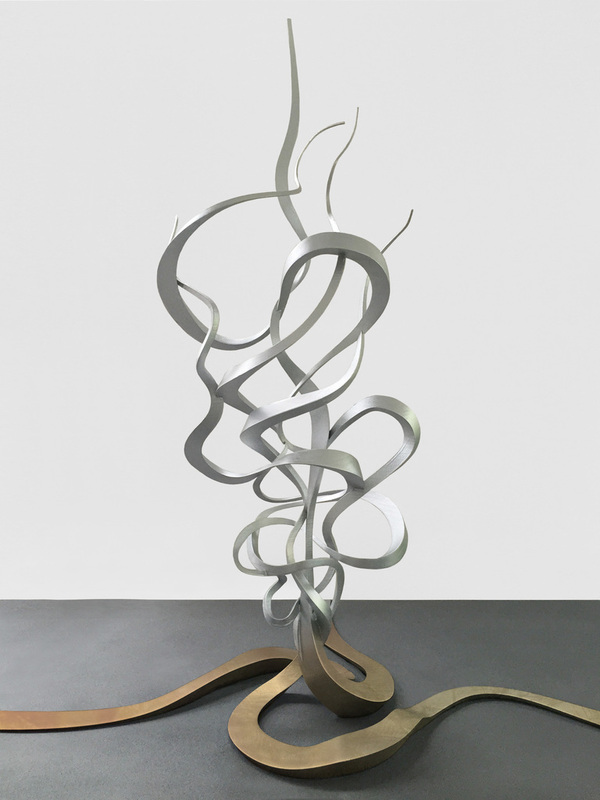 The Olympic ideal of ‘swifter, higher, stronger’ is manifest in its composition evoking the sensuousness of muscle and sinew and the pursuit of excellence. Conversely it may be seen as the fire or flame that ignited the Olympic movement. 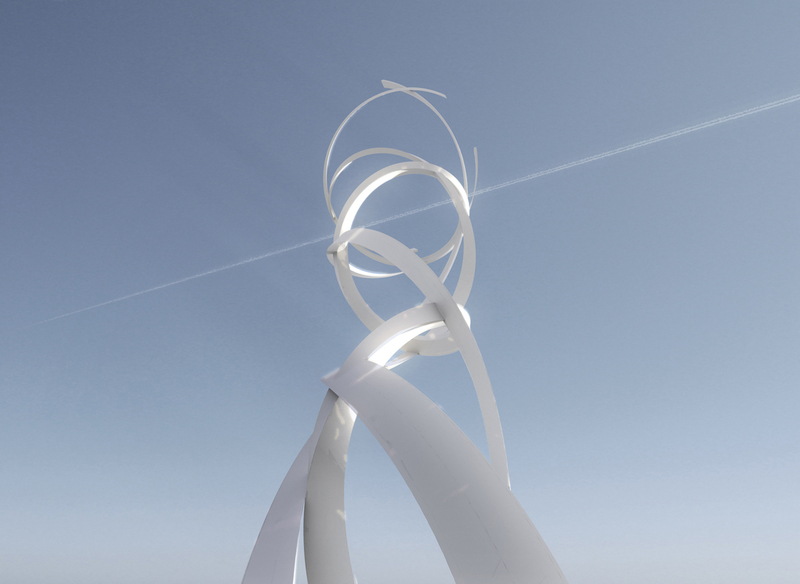 In Legacy mode the sculpture and its organic form will become the centrepiece of the new park as it transforms and matures over time. 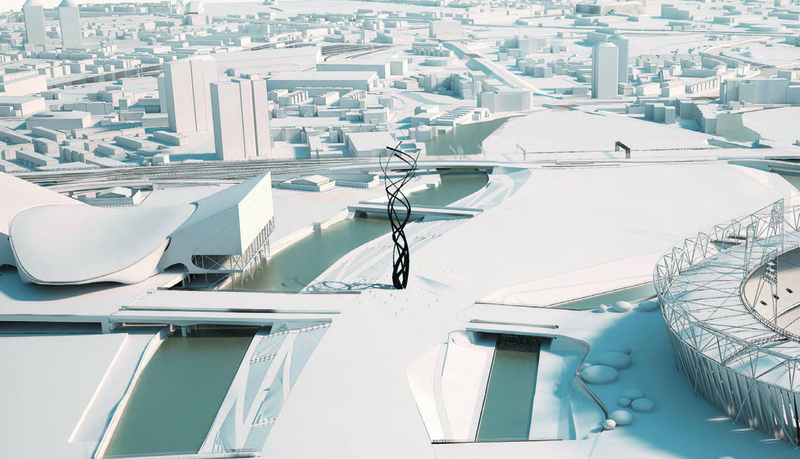 The sinuous rhythm of the steel ribbons will be an object of imagination, inspiration and beauty and be completely in tune with its natural surroundings, the winding canals and waterways of the River Lea, the newly planted native species trees, and the wetland habitat for wildlife. The proposal is to be an aspirational and long lasting symbol for the park and its unique identity. 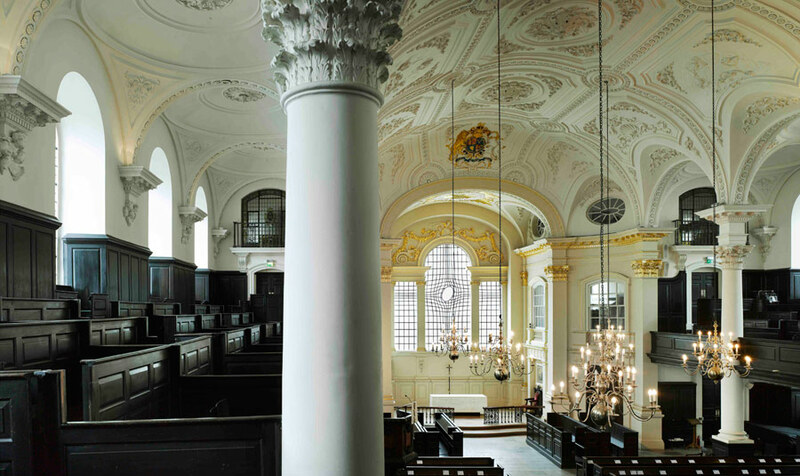 James Gibbs great church was completed in 1726 and has recently undergone complete renovation and restoration. 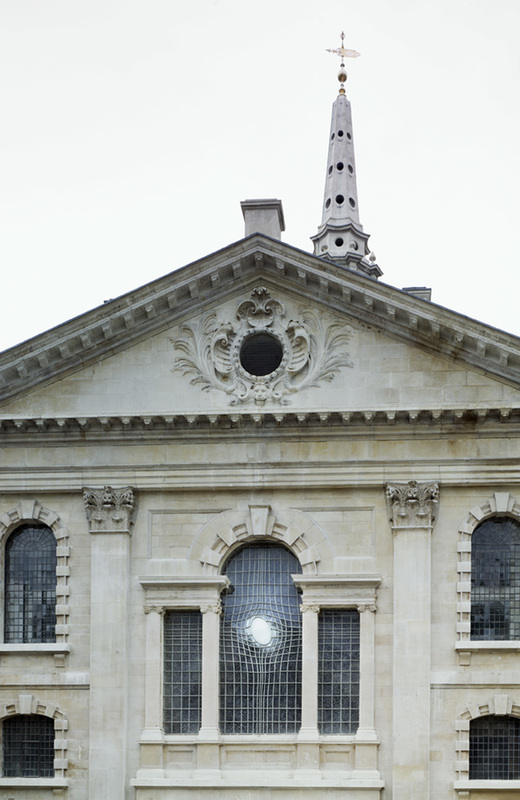 The original vision of Gibbs was to have no stained glass and that all glazing was made up of simple mouth blown glass. 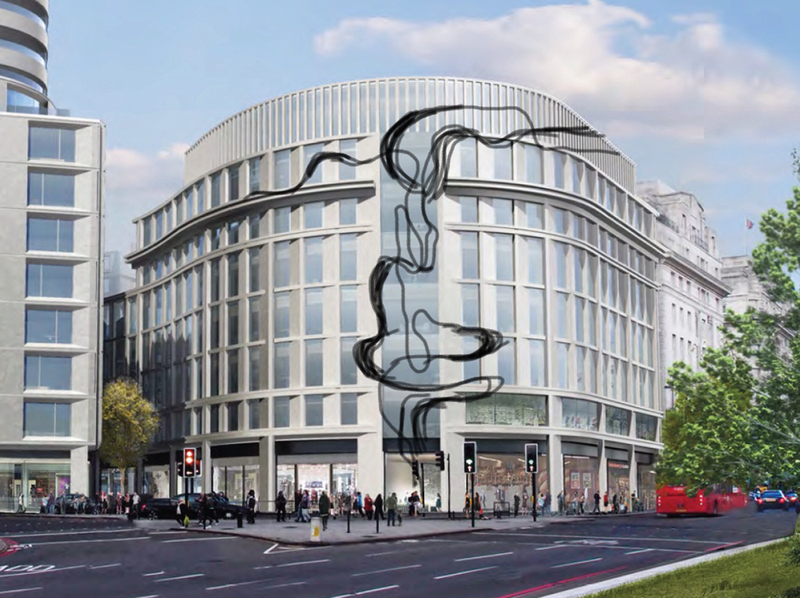 Its most important aspect is the East elevation and the new East window is a monochromatic design celebrating light. 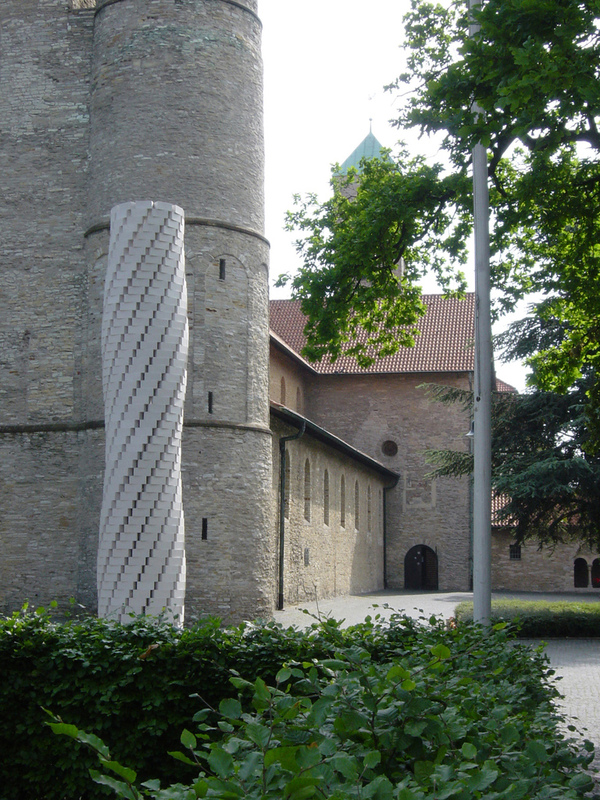 It is an abstract design, but has strong religious, spiritual and architectural resonances. The window is held within a shot peened stainless steel framework comprising of hand made glass panels etched on both sides with a subtle feathery pattern based on fragments of Houshiary paintings. 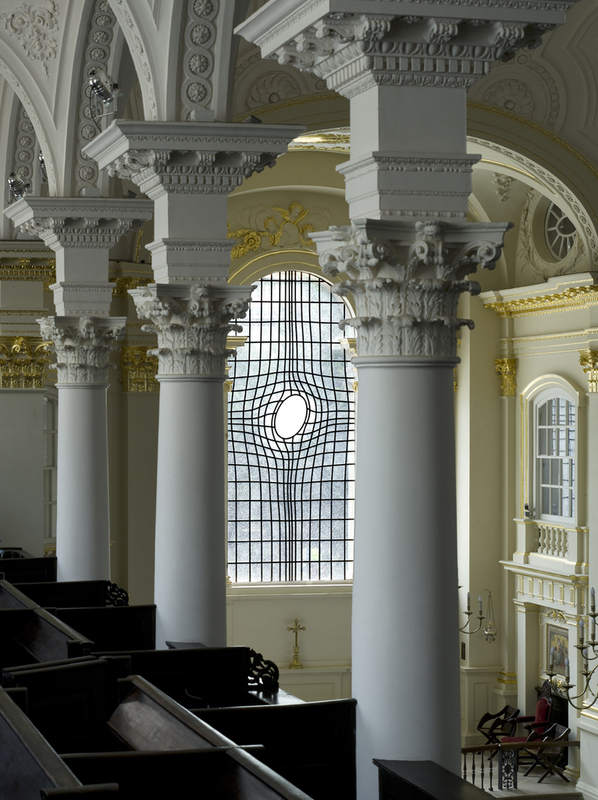 The warp and weft design of the structure and the twist at its centre creates a vertical energy echoing the agony of the cross. 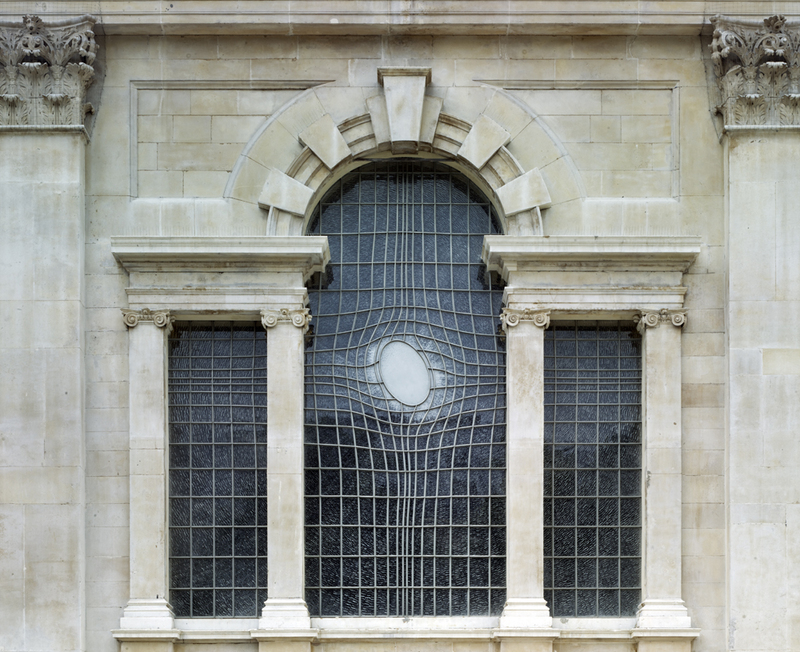 The centre ellipse is an icon of contemplation and echoes the original architectural and decorative elements within the church. 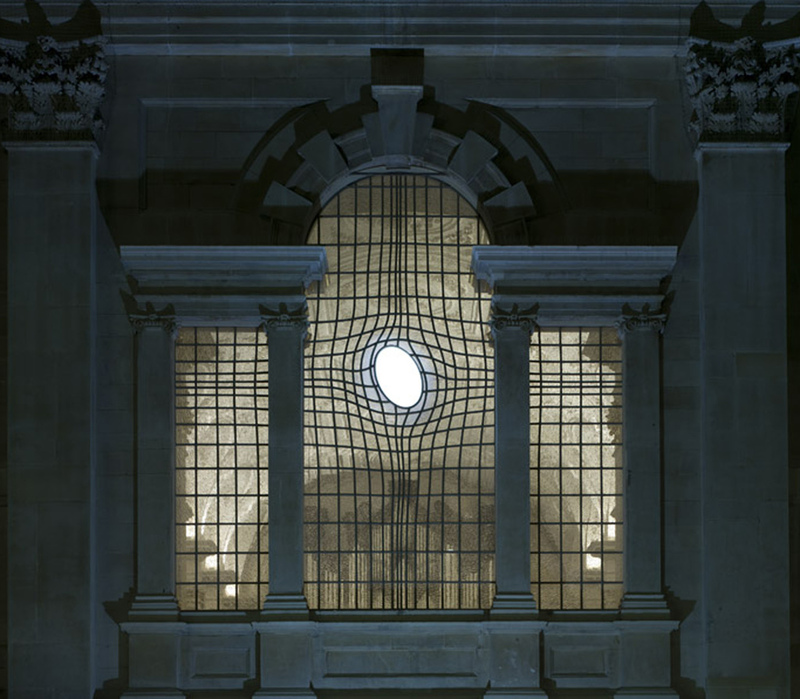 Each evening the ellipse is subtly lit and increases with the fading light to create a strong visual effect that can be seen from both inside and outside. 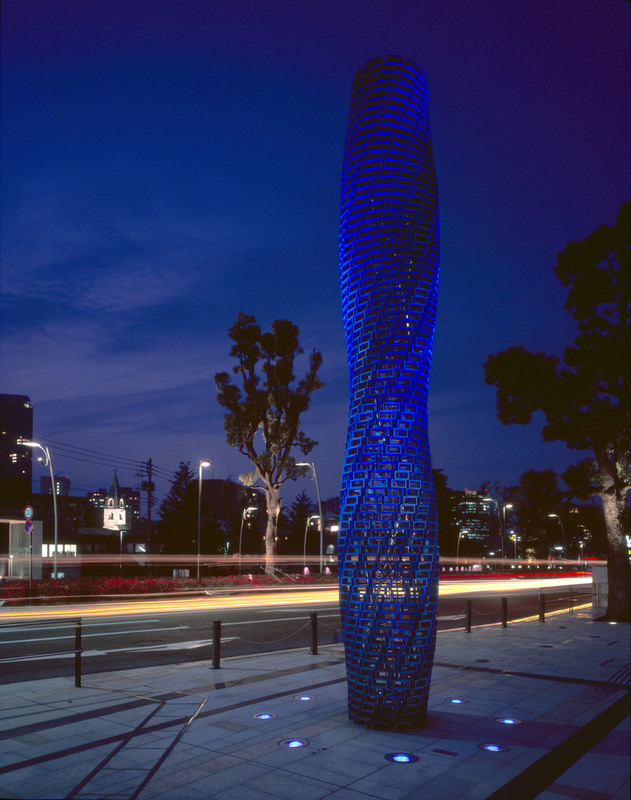 Situated at the threshold of the Tokyo Midtown development this sculpture tower is constructed in hollow aluminium blocks, anodized in a light blue colour. 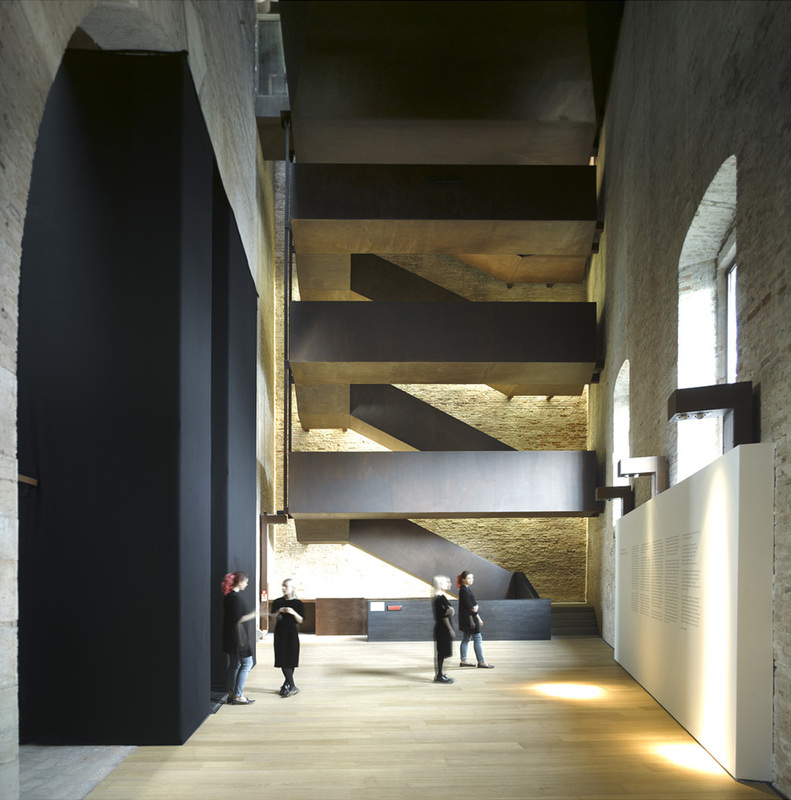 The internal structure is complex as it has to comply with rigid safety standards and to withstand earthquakes. 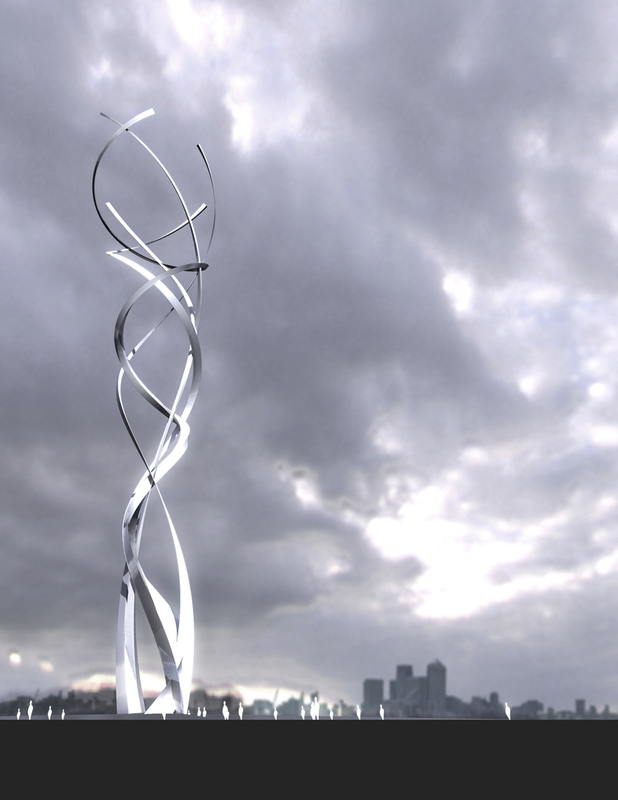 It is made of stainless steel and polished to a mirror finish to dissolve inside the piece. 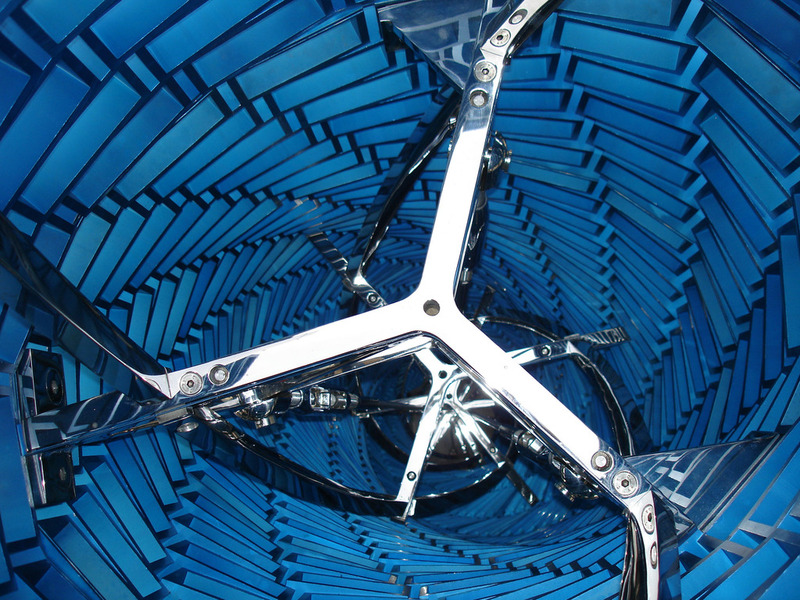 The internal structure is seen as complimetary to the overall form. 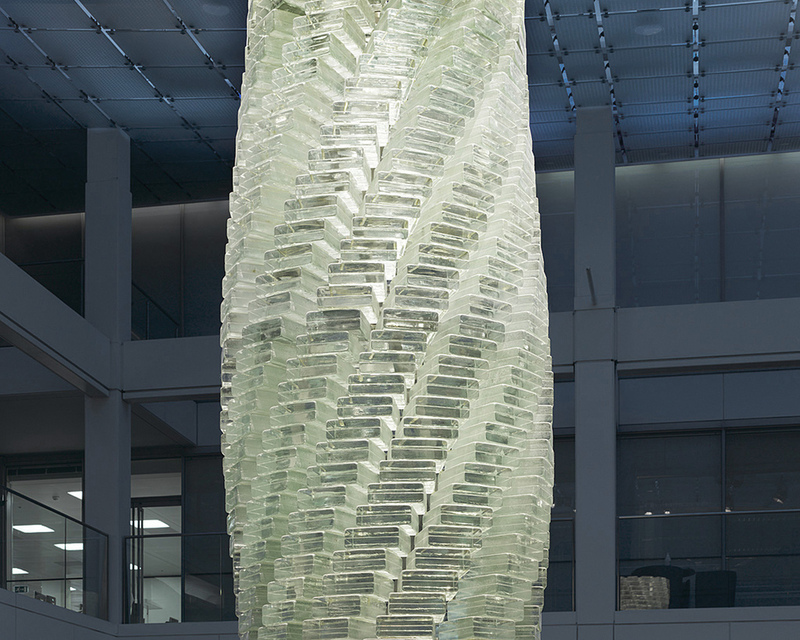 The movement of the tower is in the colour as well as the shifting multi faceted filigree of blocks. 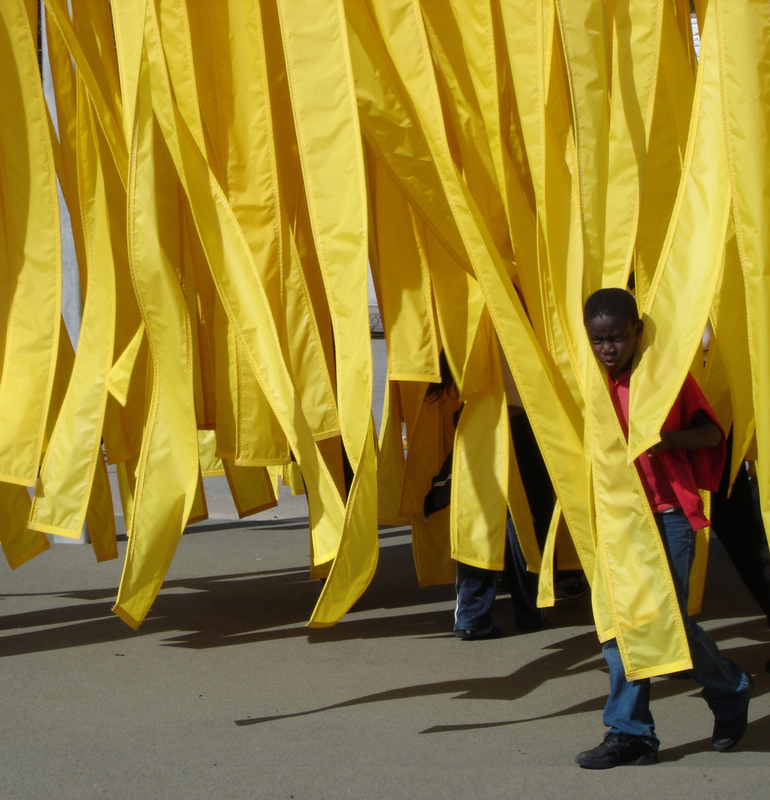 The brief by ‘Art for the World’ was to design a playground for children who have experienced was and destruction and who have been robbed form the experience of childhood. This is a playground which challenges the traditional model of robustness. Inspired by a passage in the movie ‘Stalker’ by Tarkovsky the poet tells the scientist in the ruins of a nuclear disaster that ‘life is fragile and soft and death is hard and strong’. 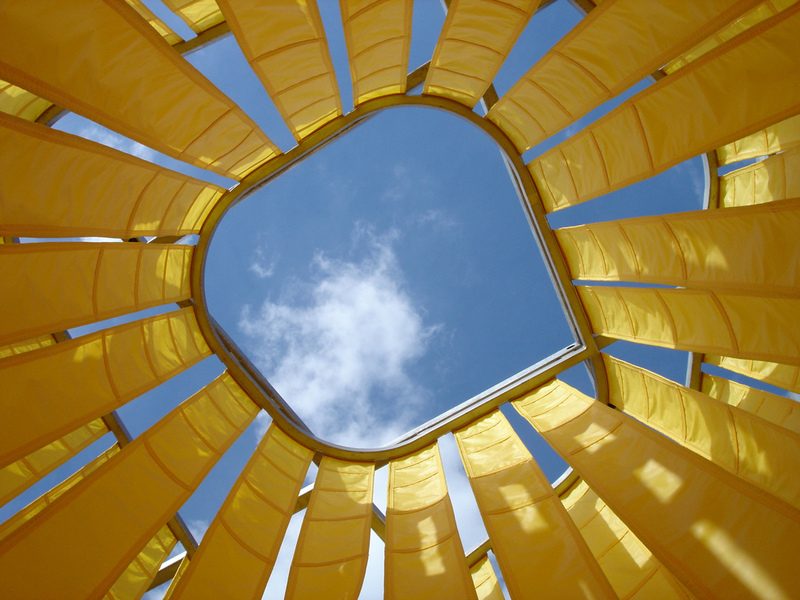 It is a cube of 5 metres and made of suspended yellow fabric which oscillates with the wind and weather like being in a cornfield. Children who have experienced such devastation will understand the softness of this experience, and see it as a place of wonder and escapism, reflection and optimism. 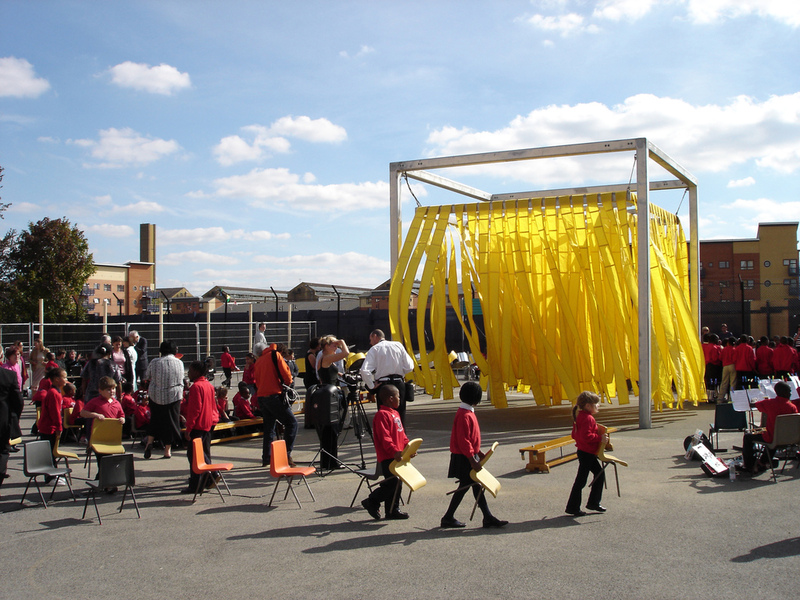 Sited outside a school in south east London as a prototype the playground structure and fabric can be modified to suit the particular site conditions in war torn/devastated areas of the world. 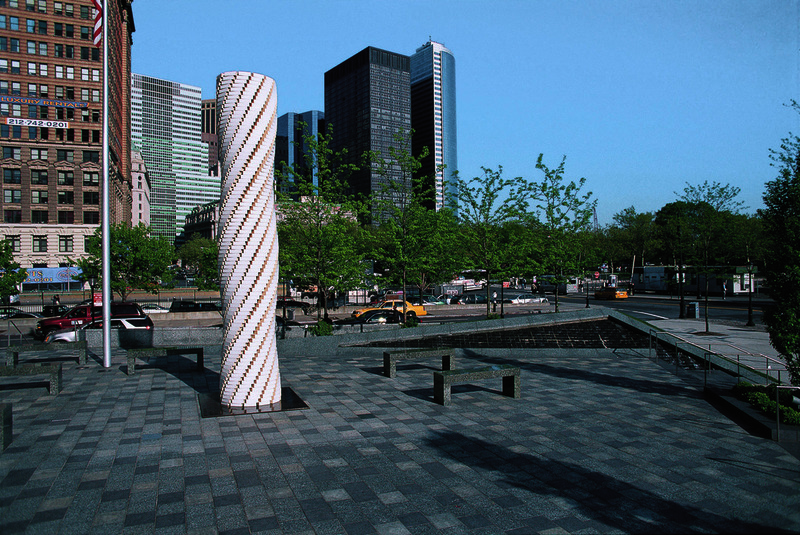 Created in the vicinity of Ground Zero in lower Manhattan this sculpture tower is constructed in glazed white bricks chosen to dissolve in the intense light. 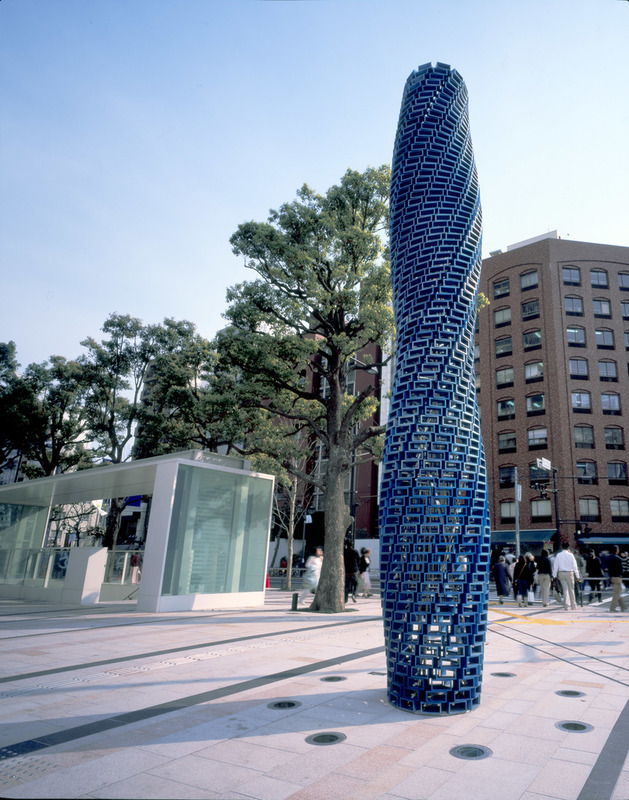 The surface of the tower is perforated. Sound emanates and reverberates from its interior with chants of four different cultures… Christianity, Buddhism, Judaism, and Islam. These chants interweave from dawn to dusk. They are the call for unity and connection. 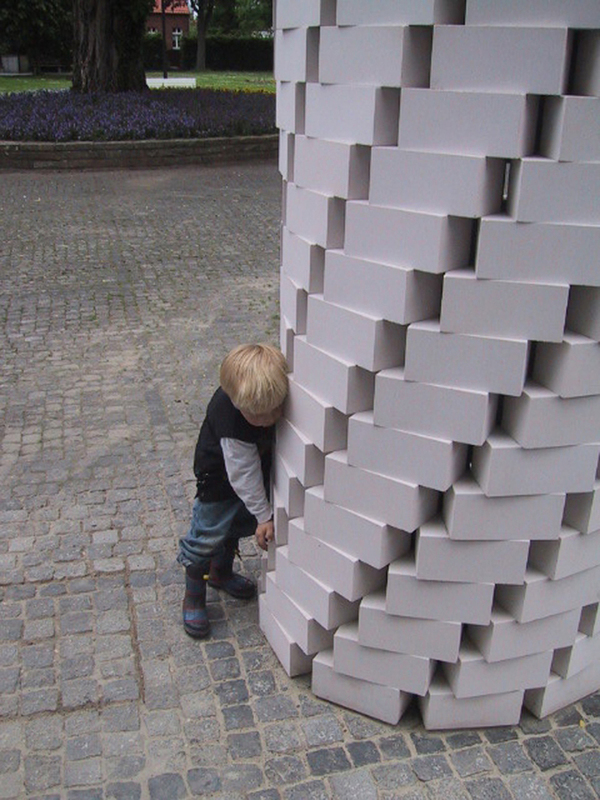 This is a sculpture tower made with large cast white limestone blocks and a sound system is installed within. 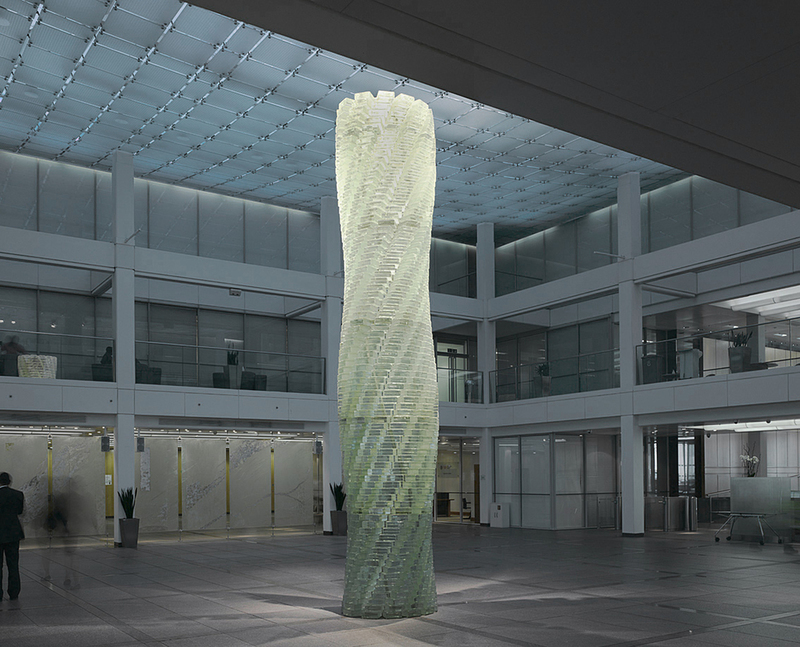 This sculpture tower is sited on the atrium floor of the Bank’s HQ building. 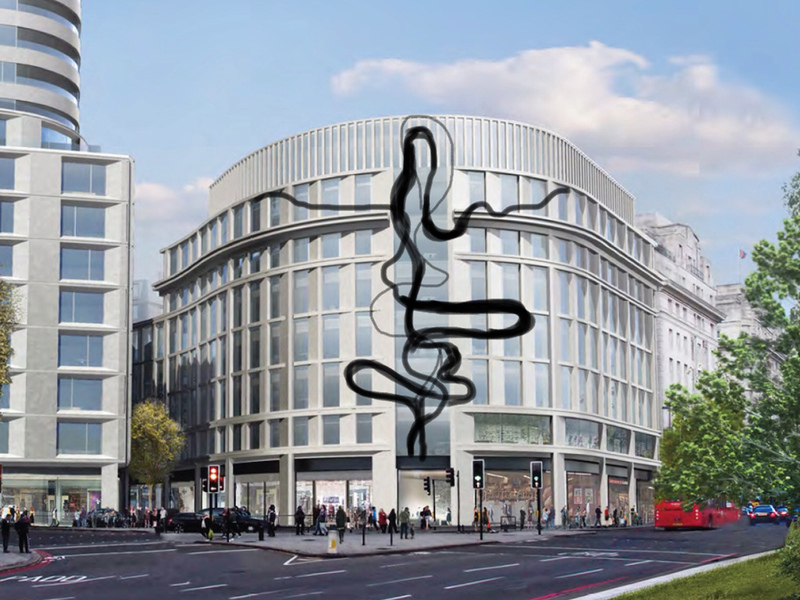 It is constructed from cast glass blocks creating a translucent skin around the helical polished stainless steel structure within. 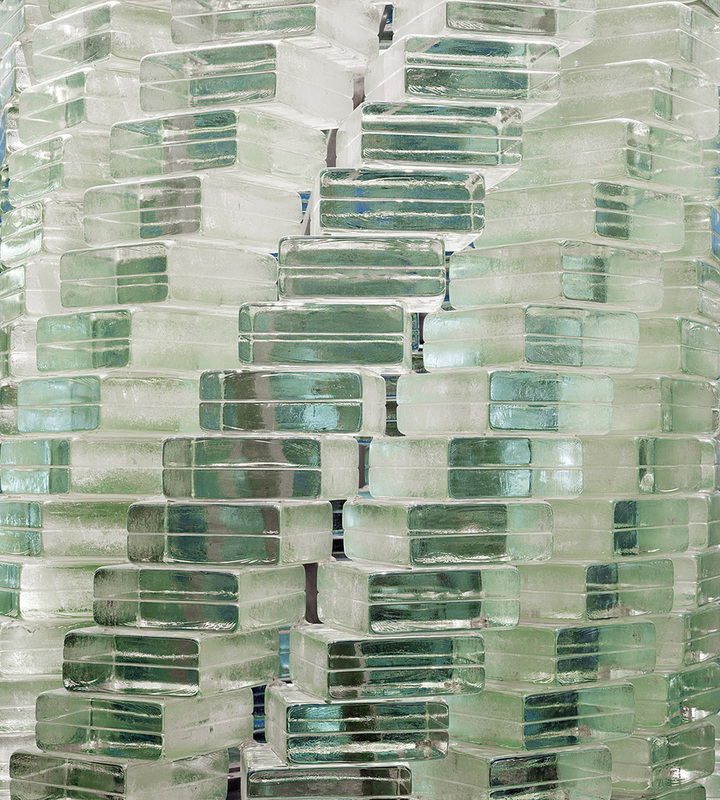 The changes of light animate its vertical movement revealing at times a column of air, ice or water. 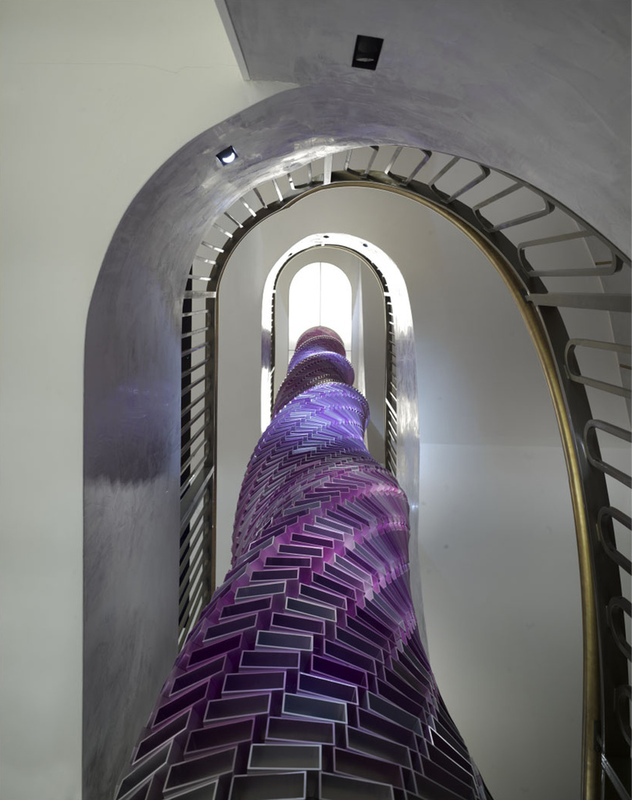 This fluidity of change allows the viewer to contemplate its playfulness. The site at the far end of Claraplatz is a busy urban centre and transport terminus. 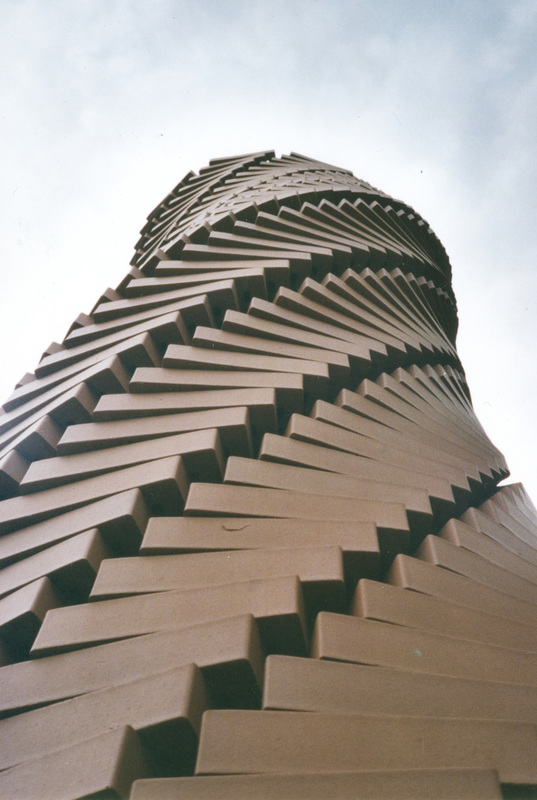 The sculpture tower is made of a single leaf of terracotta bricks with a hollow centre. 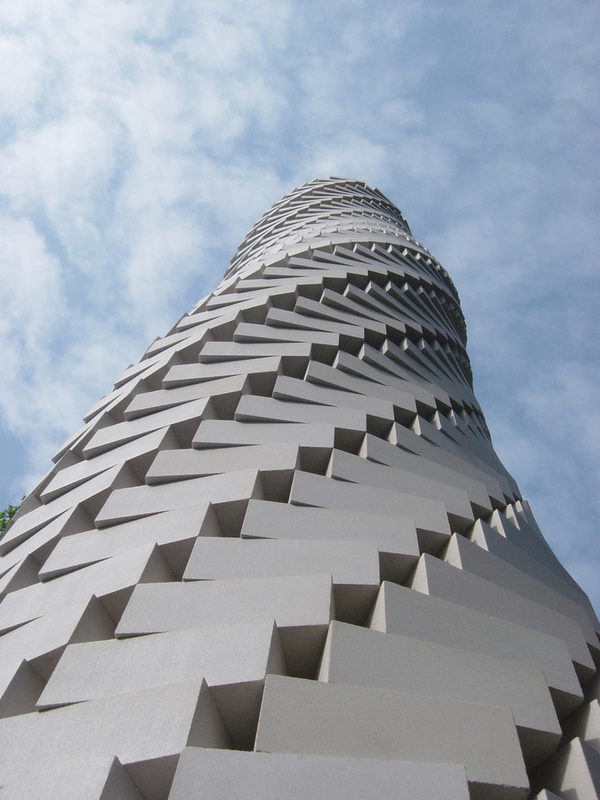 Each course of bricks rotates by 4.5 degrees and rises to complete a full revolution within its overall height. There is no mortar joint between bricks and brick courses. 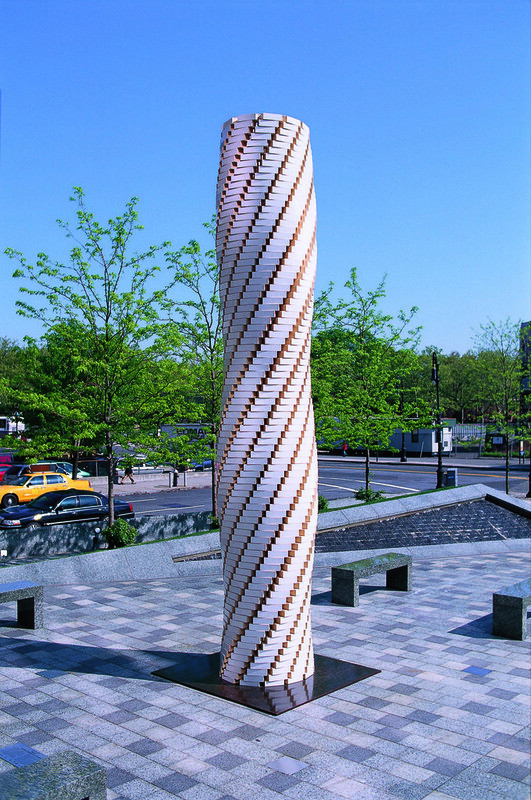 The column creates visual movement transforming its dual nature of earth and weight into air and lightness. 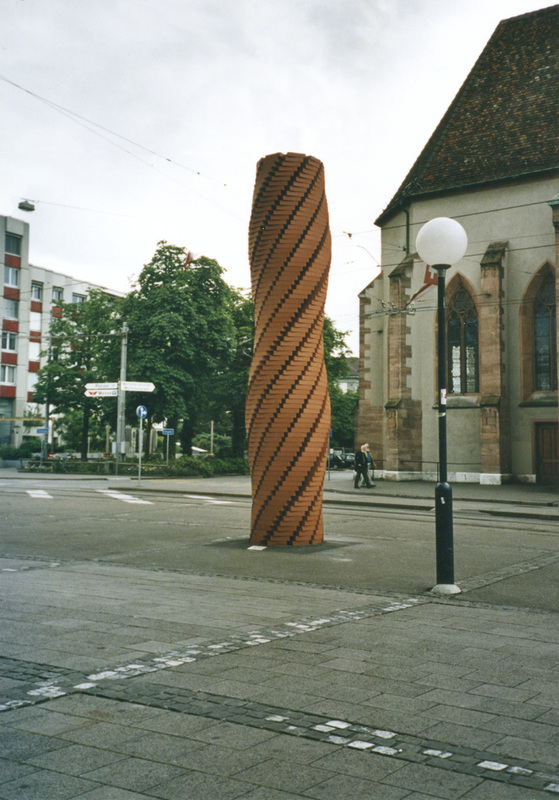 Of particular interest is the column as seen by the typical tram passenger gliding by and witnessing its changing form and vertical energy. 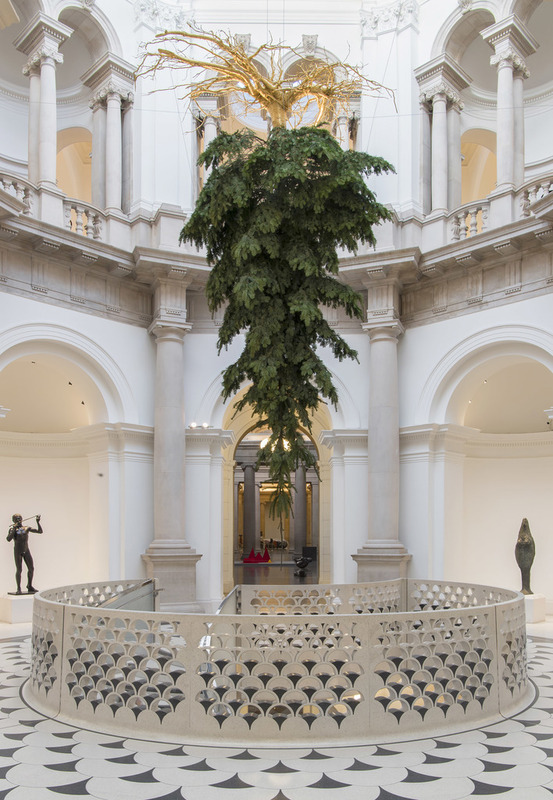 Invited to create the Tate Gallery Christmas Tree the intention was to move away from the traditional notion of decorating the tree and instead focus on its natural qualities. 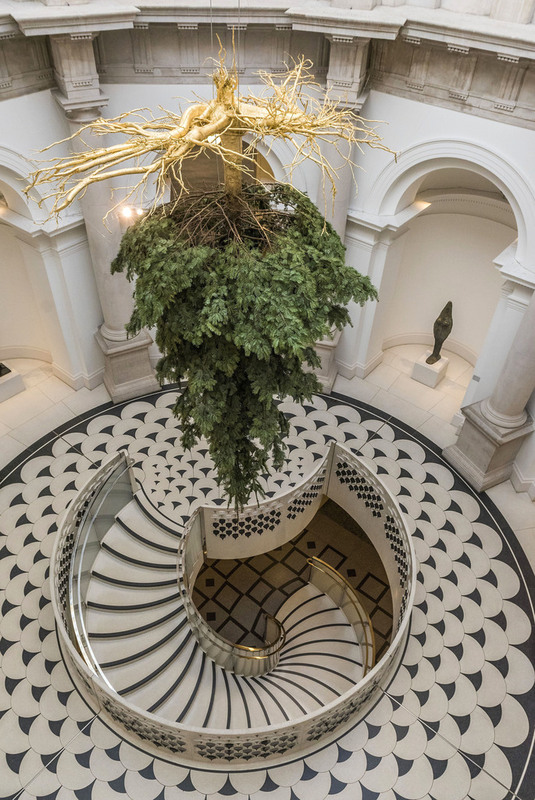 The fir tree was turned upside down hanging it from the Gallery ceiling and exposing its roots. 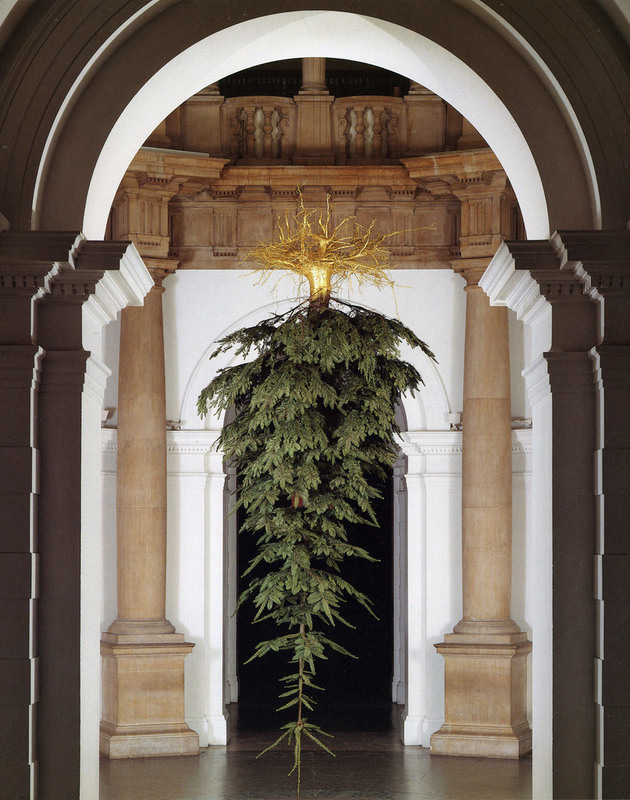 These were covered in gold leaf to focus light upwards away from the branches and to ‘take earth back to heaven’.